Composer Efrem Podgaits has composed more than 280 works in different genres (13 operas, 6 musicals, 2 ballets, and a number of pieces for symphony and chamber orchestra, choir and solo singers as well as music for cinema and theatre). His compositions are widely performed and have been recorded in Russia, Ukraine, France, Germany, Great Britain, Italy, Hungary, Japan, Switzerland, Croatia and USA. He places equal importance on his music for children and is considered to be one of the most versatile and outstanding contemporary Russian composers. In 2002 the Russian monthly Musical Review named him Composer of the Year. His music has been performed by world renowned artists including Mstislav Rostropovich, Vladimir Yurovsky, Yuri Bashmet, Lubov Kazarnovskaya, Friedrich Lips, Alexsnder Gindin, Roman Kofman, Valery Polyansky, Vassily Sinaisky, Vladimir Ponkin, Saulus Sondetskis, and many others. He has had a continuing involvement with the Moscow-based Vesna Children’s Choir, directed by Alexander Ponomarev, and their wonderful performances of his work have brought Podgaits well-deserved recognition both in Russia and abroad. 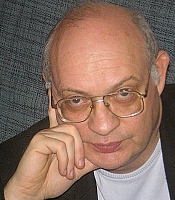 Efrem Podgaits is a professor at the Ippolitov-Ivanov Moscow State Musical College, where he chairs the Department of Composition. Member of the Russian Union of Composers, member of the Boad of the Moscow Union of Composers, was awarded the title of Merited Propagator of the Arts of Russia. The Russian monthly «The Musical Review» named E.Podgaits «?omposer of the Year 2002». In 2008 Efrem Podgaits won the Bolshoi Theatre / Russian Theatre Union Competition for the best children’s opera or ballet; his winning composition, the ballet Moidodyr was staged by the Bolshoi Theatre. Member of the Russian Union of Composers, member of the Boad of the Moscow Union of Composers, was awarded the title of Merited Propagator of the Arts of Russia. The Russian monthly «The Musical Review» named E. Podgaits «Composer of the Year 2002». Information about concerts and performances here.